Home mobile app development services How Promising and Competitive is Amazon Alexa/Echo as a Product? How Promising and Competitive is Amazon Alexa/Echo as a Product? Amazon’s Echo which runs on Alexa operating system is not a single entity but a bunch of multiple applications. With a first capability of being a wireless speaker, it is also a digital assistant and a smart device that takes user inputs in the form of speech. 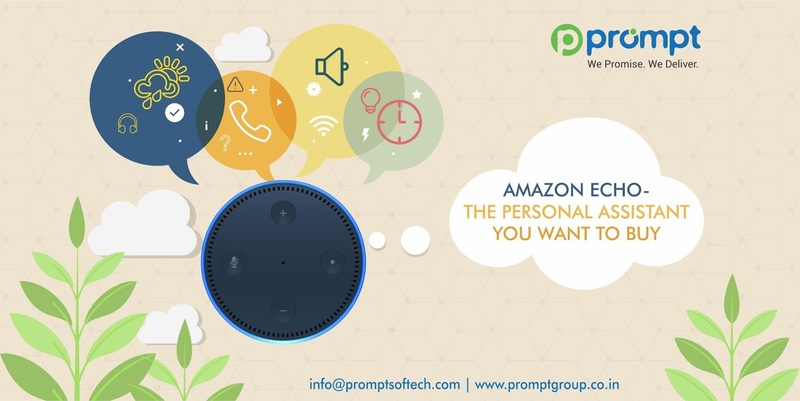 With the product entering in its second generation, it has advanced many folds in responsiveness of its voice assistant and used with innovative mobile app development services. Also, being backed by AI algorithms for a sufficient time, it has now become one of the prominent forces in the market of intelligent digital assistants. To set up an Amazon Echo is not at all complex, all you require to know is tuning up with Alexa and all her skill-sets. Following the installation steps will make your Alexa assistant ready to be utilized. Alexa enabled mobile apps can be developed utilizing Amazon’s Alexa Skill Kit. Alexa skill-sets itself is relatively helpful. However, even with a reorganized skills section in the Alexa application and the capacity to add skills using the voice makes the things more useful. So much so that Amazon essentially built an ability known as Skill Finder to discover innovative talents. It can be launched by saying, "Alexa, tell Skill Finder to provide you the skills of the day." Even numerous third-party developers have built skills for Alexa, comprising games, quizzes and stuff used in day to day routines. You can keep tabs on your car with Alexa utilizing the Automatic skill. Automatic is a dongle you install in your car's OBDII port which attaches to your smartphone and monitors the status of your vehicle. You can join your Automatic account to Alexa and ask for the present fuel level, where your vehicle is or how far you have driven in a specific time span. The Harmony skill by Logitech enables you to organize your entertainment system using your voice by a hub-based remote. You can say stuff like, "Alexa, turn on the TV," or "Alexa, turn on the Cooking Channel." The Anova Precision Cooker possesses an Alexa skill using which you can explore cooking guides and start cooking utilizing your voice. You can say stuff such as, "Alexa, ask Anova to assist me in cooking" or "Alexa, ask Anova to decrease the temperature by two degrees." For those who are known with the 7-Minute Workout, you will be glad to learn that there is a skill for the eminent workout accessible on Alexa speakers. Say, "Alexa, open 7-Minute Workout." The work out will commence. You can stop, pause or resume workouts as desired. Likewise, there is a skill for a 5-Minute Plank Workout. This skill runs you through 5 minutes of a range of planks with a 10-second break amid each. Not amazed by Alexa's default weather forecasting capability? You will want to enlist the assistance of Big Sky. Utilizing the Dark Sky API, Big Sky offers hyper-local weather forecasts, informing you when rain will begin or bring to a halt for a specific address or the wind pace and direction. If you are less involved in what the real temperature is and care more about how it feels remote, you can try the Feels Like skill. It will provide you the wind chill when the temperature is less than fifty degrees Fahrenheit and heat index when it is above fifty degrees. Around the globe, there are 285 million people with vision deterioration. Also, 30 million of those people are sightless. For these people, online shopping can be unbelievably challenging. Screen readers can be complicated to use, sometimes taking quite a lot of time to depict a particular page. Amazon Alexa allows users to put in items to online shopping carts by utilizing voice commands. Amazon Echo device can put forward products in the online catalog and have those products in the shopping cart of an iOS app. The users can tell the Echo to read the contents of the cart back to them before insertion of their finishing order. Given, the prime competition of Alexa today is the Google Assistant, with its freshly unveiled human-like interaction abilities, and secondary race by Apple’s Siri which is supported into its just made public smart speaker Home Pod. Regarding pieces sold, Amazon’s echo is, without doubt, foremost in the race to revolutionize home automation market with twenty million echo units by the end of the year 2017, with its initial piece being sold in the year 2015. Partnering up with Cortana? - In the year 2017, Amazon and Microsoft declared that their relevant digital assistants would be able to converse with each other. This has not been accomplished yet, but once they add this ability, it would be a massive bump to Echo sales. The web browser is still the most familiar and preliminary point for searching for information as well as buying online. Most people commence with a search on their typical search engine and click on the outcomes, or type in a URL that they expect to have the details they require online. However, experts say that this old way of web browsing is now challenged by a “kind of an innovative browser” in the form of Alexa which can very well predict user requests. Also with further use, Alexa will discover more things by learning from us and will support new mobile app development services. With time it will strengthen the flow of its algorithms and position itself to serve us better. Paying the bills, reading account balances, booking an Ola or Uber, turning on TV programs and setting-up a wake-up alarm are all in the sphere of what you can do. Although this is only the tip of the iceberg and there would be multiple applications which will come in to picture soon.